First, the small incorporated town we live in (Ridgeway) is not much more than a zip code, but it’s adjacent to Martinsville…again not very big with less than 10K residents. 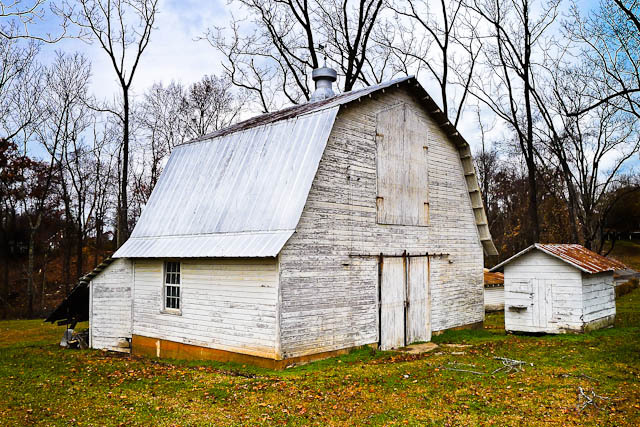 In the middle of Ridgeway sits this rustic looking barn with smaller out buildings. When we first moved here in 2002, there was a farm house next to the barn, but a few years ago it burned and the remains were cleared, leaving the other buildings sitting all alone. As I drive to our daughters house, I pass right by this barn and told myself each time to stop and make a photo. Over Thanksgiving weekend I did just that. One thing I discovered about this barn was a nice pile of junk behind…fun to look through. So, even though we live in a rural part of Virginia, I always find something interesting to photograph. Next PostNext English Country Home?